BIO-WEST conducted a water bottom assessment and oyster verification survey in support of a 3D seismic survey project in Terrebonne Parish, Louisiana. The survey encompassed 2,630.92 acres in Bay Junop and 543.07 acres in Lake Mechant, which is south of Morgan City. 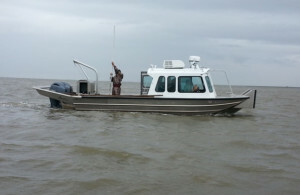 Bay Junop and Lake Mechant are both located within the Louisiana Department of Wildlife and Fisheries Coastal Study Area and support active state oyster sampling sites. 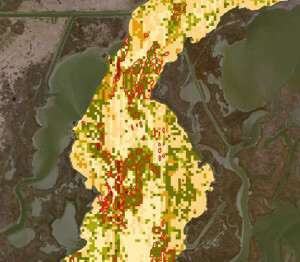 BIO-WEST assessed the water bottoms and verified oyster beds according to the Louisiana Department of Wildlife and Fisheries’s Sampling Protocol for Projects in Public Oyster Areas. Side-scan sonar was used for remote sensing and oyster verification through quantitative sampling. The remote-sensing survey was conducted using a deferentially corrected GPS, side-scan sonar, and a survey-grade, single-beam echo sounder. An accompanying physical investigation used poling to verify (ground truth) remote-sensing results. BIO-WEST’s scientific divers collected additional biological data on oysters and oyster reef communities. Survey results were depicted on maps and in ArcGIS. The remote-sensing survey produced environmental data, identified existing obstructions (e.g., pipelines, well heads, debris), and provided depth contours for use in future project-planning efforts and mandated US Army Corps of Engineers permitting.